Biofuels have a bad reputation for eating up precious land and water resources, as well as pilfering food from the world’s hungry. But a groundbreaking new bioenergy pilot plant at Masdar City, Abu Dhabi’s growing clean energy hub and research institute, is pioneering a new paradigm. This desert plant that will be irrigated with seawater will make bioenergy and food production harmonious — perhaps for the first time in history. 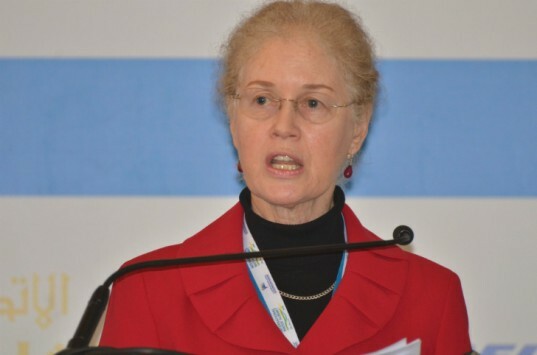 The Sustainable Bioenergy Research Consortium (SBRC), founded by Masdar Institute of Science and Technology (MIST) in cooperation with Etihad Airways, The Boeing Company and Honeywell UOP, announced during Abu Dhabi Sustainability Week that they are awarding a contract to International Mechanical & Electrical Co (IMECO) to build the plant, which will produce renewable biofuel for the aviation industry. The plant, where the consortium will conduct research for three to five years with the long-term aim of scaling up production and yield, is expected to be operational as soon as the end of this summer. I know what you’re thinking. It’s not possible to produce biofuels without usurping resources necessary for food production. But that’s exactly what SBRC and MIST plan to do by using plant species that do not require fresh water or arable land to grow, unlike corn or soy, for example. Fresh water is not an abundant resource in Abu Dhabi, so any forward-thinking research and development should deploy resources that are both ubiquitous and endemic to the region. And that, apart from sun and sand, is saltwater. 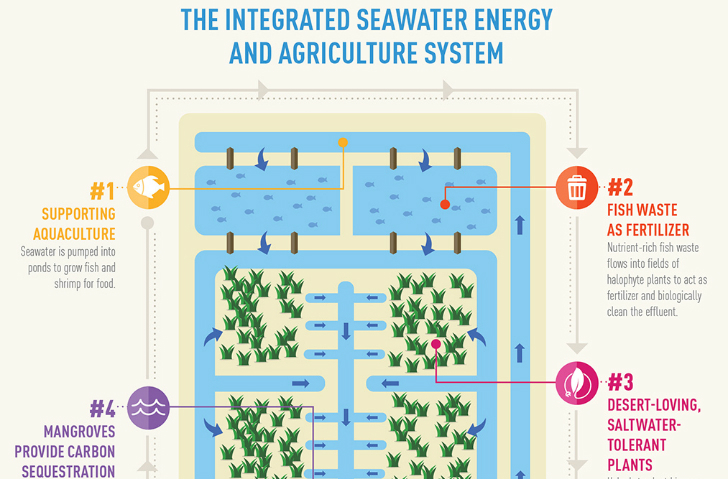 The pilot plant will use seawater and recycled waste water to grow fish and shrimp for food and their waste will then be pumped into a tank full of salt-tolerant plants for use as fertilizer. These oil-rich halophytes, called Salicornia, provide two important functions. First, they scrub effluent as the first step in an overall, closed-loop biological remediation system that results in no net waste, and they are harvested to produce aviation biofuel. Any remaining effluent will be diverted to cultivated mangroves, which remove any remaining nutrients and sequester carbon before the water returns to the sea. Alejandro Rios G, Ph.D., Director of the Sustainable Bioenergy Research Consortium notes that this is the first serious project in the world to explore the use of halophytes for biofuel. 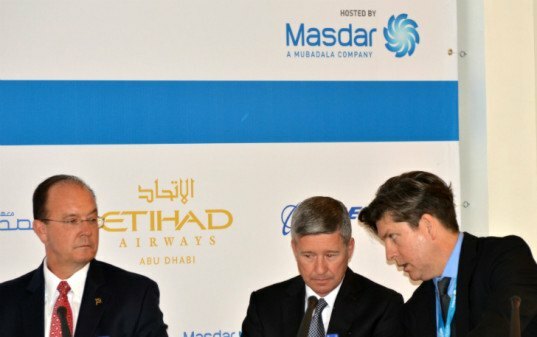 “Boeing is proud to take this important, new step with our partners, Etihad Airways and Masdar Institute, to further sustainable aviation biofuel development in the United Arab Emirates,” said Jeffrey Johnson, president, Boeing Middle East. The five acre plant will experiment with different species in six different aquaculture tanks, each comprised of varying intensities. MIST will constantly test water quality to determine how well waste and salt flow through the system, what concentration of nutrients will be necessary to grow plants and soil. The implications can’t be overstated: if successful, this kind of fuel could drastically reduce the aviation industry’s carbon emissions, and produce food in a country that relies on imports for up to 90 percent of overall food supply. Biofuels have a bad reputation for eating up precious land and water resources, as well as pilfering food from the world's hungry. But a groundbreaking new bioenergy pilot plant at Masdar City, Abu Dhabi's growing clean energy hub and research institute, is pioneering a new paradigm. This desert plant that will be irrigated with seawater will make bioenergy and food production harmonious -- perhaps for the first time in history.